One alert emailer sent along this photo of the White Sox hurler gassing up his famously scary truck constructed by demonic gorilla robots from some dusty holocaust netherworld. It's a heavily-modified Ford F-350 Super Duty. VERY heavily-modified. Wonder if he and Jon Lieber are cb radio buddies? They must drive through brick walls or go Prius hunting together, right? 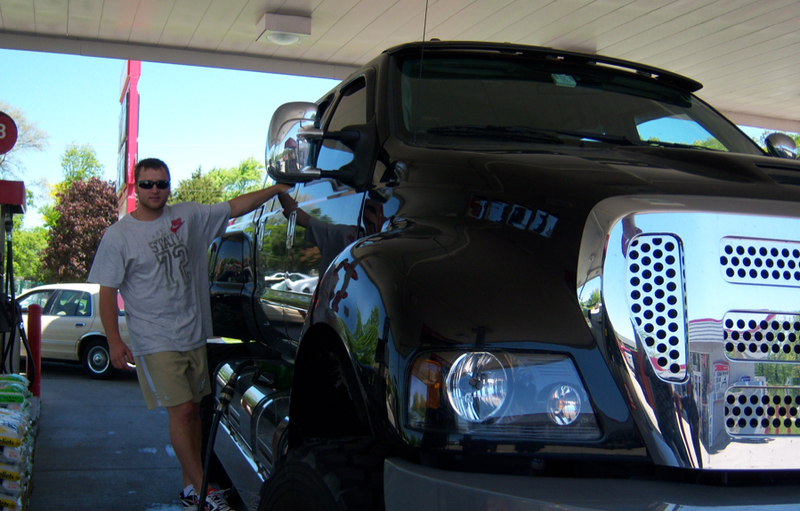 We&apos;d like to note that Phillies pitcher Jon Lieber is a real man with a real man&apos;s truck. Tonight. Watch Bron-Bron stomp Rafer Alston into a puddle of googly-eyed mess as the Magic and Cavs begin their their tromp toward the Finals. Thank you for your continued support of Deadspin. Scientology rocks.